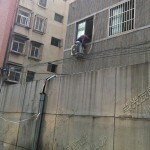 « Day 123 in Beijing: Fish Bites Man (And Woman)! 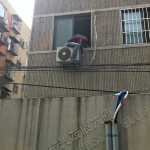 Day 124 in Beijing: How To Fix An Air Conditioner…At 40 Feet! Jill and I were walking back from lunch a few days ago and noticed a few people looking up towards the sky. We did the same and became transfixed. 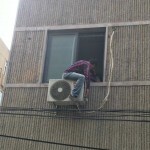 Yep, he was fixing, or installing, an air conditioning unit. The ultimate in exposure therapy for some who has a fear of heights. 40 feet high and rising.